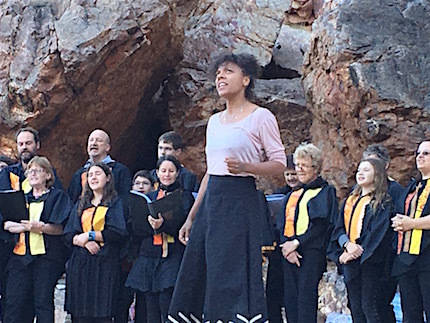 Above: Morris Stuart conducts the Central Australian Aboriginal Womens’s Choir (with three men) in Ormiston Gorge. 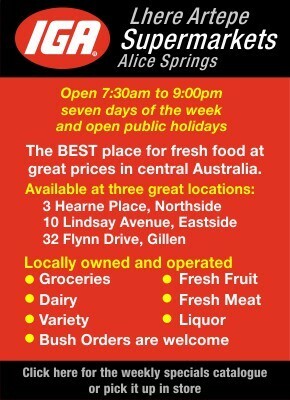 Updated 8.22am, 18 September 2018. The water was there. The country is so dry after many months without rain and the day was windy, a bit dusty, but walking into the gorge and seeing the water – not a puddle, enough to swim in and on this cool afternoon some brave children were – was like a promise fulfilled. In its presence we would experience something exceptional. The shadow of the gorge’s western flank was already on the water but the sun was still warming the blond sands of the opposite bank. A steady procession of people arrived, among them the members of the Central Australian Aboriginal Women’s Choir in their dazzling robes, each one a work of art. Members too of the Asante Sana Choir, their black tunics banded in bold desert colour. 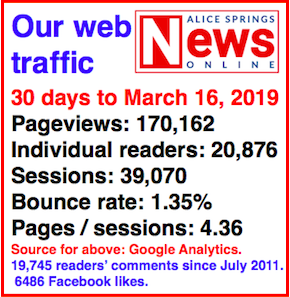 Soon the indefatigable Morris Stuart, choirmaster and director of the 10-day Desert Song festival, could be seen darting about the sand like a dragonfly. The technical set-up was simple, one microphone and speaker for introductions. Otherwise the gorge would carry and hold the music to come. Right now it was a matter of getting everyone in place. Time, if you were watching, was ticking towards 4pm. A crescent moon was visible in the bright sky directly above, small birds tracing their arcs around it. A piercing whistle called up the last members of Asante Sana. Soon they began their warm-up, face to Stuart and the audience, notes rising and falling, then face about, to the rockface behind them, paying their respects to this place. Some members of the Women’s Choir joined in, others were donning their robes behind the grand old tree that frames one side of the performance area. Others still wondered down to the water, looking biblical as they stood silently on the steep sandy bank. Basidi Kone, a Griot from the Segou region of Mali, took up his position on a high rock with his djembe. Drumming rhythms filled the gorge. Then he drew the crowd into play with him, drumming, clapping, an exchange. The curtain was well and truly raised. Stuart offered words of welcome. 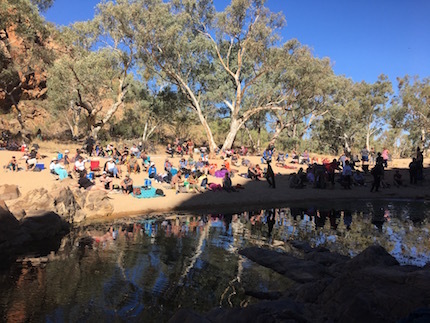 To his questions, we learned that at least half of the hundreds there had not been to this event before, and scores of people had come from outside Central Australia. 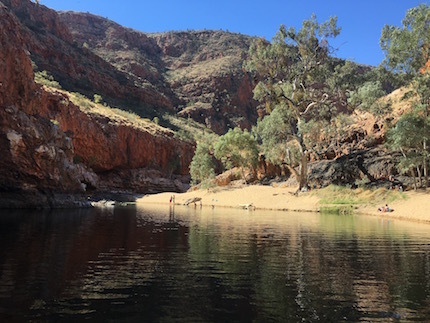 We learned too the Western Aranda name for this place, Ormiston in English, Kwarte Tweme originally and still, in Tjoritja (the West MacDonnell Ranges). Asanta Sana followed Kone’s drumming with a tribute hymn to Nelson Mandela, a signature song for this choir. 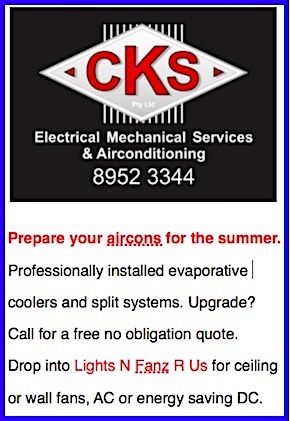 They come together across the cooler months, responding to a callout by Stuart, first made in 2013. Hundreds have cycled through the choir over the years; this year at least half of the members were new-comers. Their repertoire was built on South African revolutionary music but has expanded to include other traditions and contemporary compositions. Whatever they sing, though, its message is always about a better world – one that is peaceful and just and inclusive. Stuart’s programming for the festival is along the same lines. 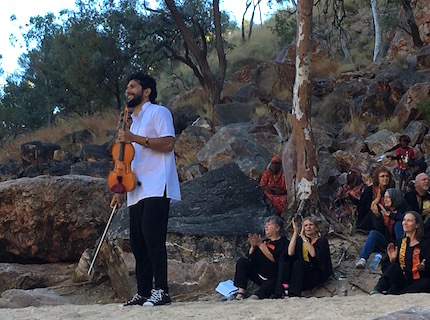 As much as he has taken unique Central Australian cultural expression out into the world – with the Women’s Choir’s international tours – he brings other cultures in, next guest in the line-up a case in point. Like the Women’s Choir, Sang Mei-Chuan (left), a woman of Taiwan’s First Peoples, is keeper of a waning tradition. A woman, she is learning and singing the songs of men when there are no men singing them anymore. Without the microphone, her magnificent voice rang out in the gorge, a Warrior Song. As a warrior must summon strength for battle, so she summoned a performance of exceptional power. Every line of it had drained her energy, she explained through her interpreter. She asked for indulgence if the next song was not done well. Although she used the microphone for it, there was no case for apology. Charmingly she said that the song, ‘Cherish’, was about her cherishing every day in Australia – she didn’t want to leave, she would miss the land and the people. There may be other layers of story in the song’s original lyrics, but there could be no doubt about the longing Mei-Chuan conveyed. She was a hard act to follow but Quetzal Guerrero (‘Q’, below right) was entirely up to the task. 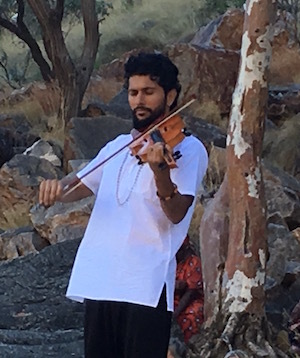 Last year, this small elegant man of outstanding talent and Mexican, Brazilian and Native American heritage, suddenly appeared in the gorge perched on a high rock, a sprite come up out of nowhere to give an electrifying high tempo performance on the violin. This year, he made a quieter entrance, walking calmly to the centre of the performance area. He began bowing, eyes closed, up and down his instrument, following, it seemed, his mind’s eye up and down the gorge or perhaps carried there on the gusts of wind, taking everyone along with him in these sallies, backwards and forwards, rising and falling. You could feel the intensity of the collective listening. 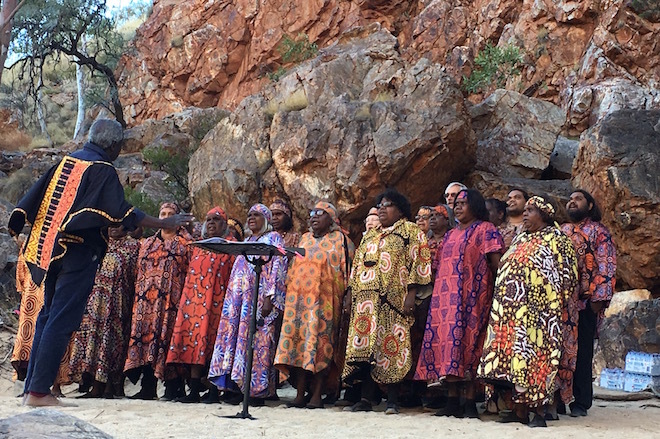 Then came the Central Australian Aboriginal Women’s Choir. Among its members from several communities and language groups are three men. Stuart paid particular tribute to one of them, David Roennfeldt, who also is not Aboriginal, but communities of creation are complex and inclusivity can be one of the wonderful things about them. 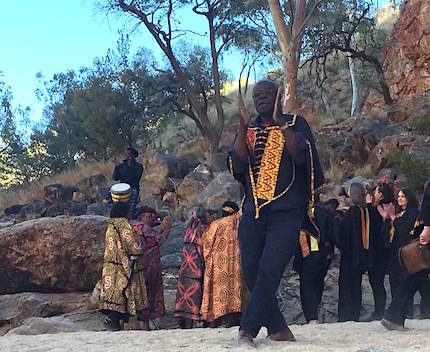 Roennfeldt is a longtime Ntaria resident, married into a Western Aranda family and a fluent Aranda speaker; for years he conducted the Ntaria Ladies Choir when it looked like the tradition would die. 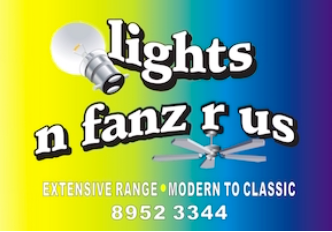 It has revived and strengthened and found unexpected acclaim under Stuart’s leadership. He explained the choir had thought about changing the name to reflect the actual gender composition, but the men had said no; the name acknowledges that it was women who had kept alive this tradition, the sacred Lutheran music from mission times, adapted to their languages, but with its Amens and Hallelujahs recognisable around the world. Cultures are living things, not susceptible – as much as some might try – to restrictive definitions. 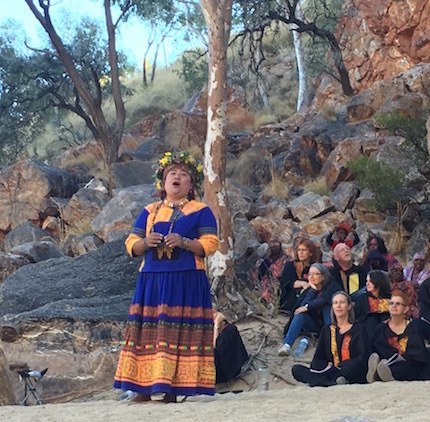 To hear the Aboriginal Women’s Choir singing Christian songs they have made their own in this special desert place, for which some of them likely have traditional custodianship, is to be reminded of the power that is in our hands – to take our traditions and (respectfully) run with them to meet our changing times and circumstances. This is the core mission of Desert Song. 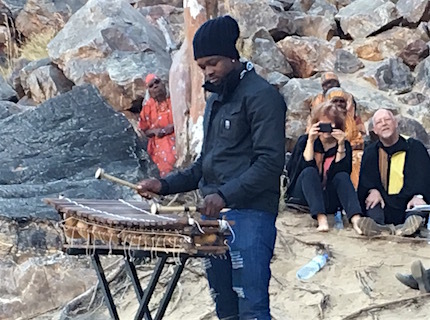 Basidi Kone returned, for a virtuosic performance on the balafon, a xylophone-like instrument from his native Mali. Asante Sana returned: they sang an English ballad full of grief for the futility of war (‘The Rose of York’) and, with soloist Emma Stuart, they went back to the origins of their repertoire, with a South African work song. A verse in English goes like this: “You can blow out the candles, but you can’t blow out the fire.” Stuart and his choirs have lit a creative fire and around them many small fires are burning – already beyond the horizon next year’s festival is sparking. Morris Stuart joins in the clapping exchange with Basidi Kone on djembe.• Basidi Kone on the balafon. • Q takes a bow. • Emma Stuart with Asante Sana. • Asante Sana finale. Wonder-filled and inspiring report. Holidaying in Penang so this evocative clip has been some consolation for missing out. Morris has put together a wonderful festival. I missed the gorge, but got to the Saturday night at Araluen. 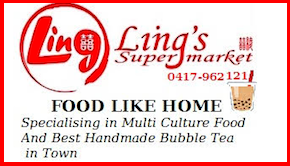 Outstanding performance, where else could you experience anything like it? Congratulations to Morris for his amazing effort. Fantastic! Congratulations Erwin and Kieran for your coverage. Nerys and I are in Adelaide. I have had some surgery and doing radiotherapy until end October. Nerys is a wonderful carer for me and this edition has made our day, while at the same time bringing on homesickness. Keep singing, all you choirs. Special greetings to Morris and Barb. A very well described event by the journalist and it was truly a wonderful experience.